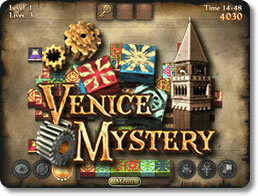 Venice Mystery Game Review - Download and Play Free Version! Small I-Spy-like games incorporated into the quest mode. Far-fetched, yet interesting story line that will keep you playing. 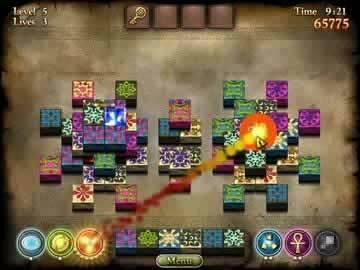 Special tiles can be extremely useful in finishing puzzles. Features like tiles and game piece layouts are not adjustable. In Venice Mystery, you must find the secrets to the lost device that will keep Venice from flooding and destroying all life on the island. Travel through the beautiful city of Venice, one of Italy's most intriguing cities, and solve an ancient mystery before Venice sinks into the water. Magic puzzle levels will guide you to thirteen forgotten paintings that hide a lost secret. Will you be able to uncover the paintings in time and discover the old machine that can save Venice? Venice Mystery is another one of the many mahjong tile games that tries to be unique and cutting-edge. The storyline is the device the creators used to make this game distinct; however, it is not strong enough in itself to make this a game that stands out from others. This tile game is a quest based game that has you traveling the waters of Venice in an attempt to save 13 valuable paintings that will be lost if the city sinks. Your successes are rewarded through points and clues that improve your chances of uncovering the clues and saving the precious works of art. Mahjong, for those of you unfamiliar with the name, is a Chinese tile pairing game. Through pairing up like tiles you eliminate them from the game space. The goal of the game is to eliminate all of the tiles as quickly as you can to unveil the lost keys. Once uncovered the keys open the door into the next level. This game has a dock of tiles at the bottom of the screen that are to be paired up with the tiles on the board. By clicking on a tile in the dock you you select it, making it eligible to be paired with pieces on the playing field. Clicking on more than one tile in a short period of time grants combos, increasing your score while simultaneously getting rid of a lot of tiles. Special tiles and jokers are great perks that are incorporated into matching. The special tiles can rearrange the letters, give you clues where matches might be, and get rid of mass amounts of pieces in a fiery swoop. The jokers are also great because they can be matched with any piece. They have time limits, so depending on your luck you could have up to 7 seconds of tile clearing fun, great for uncovering keys. As you progress in the game you will periodically find the lost paintings. They might be slightly distorted so you will have to correct them in a small mini-game. 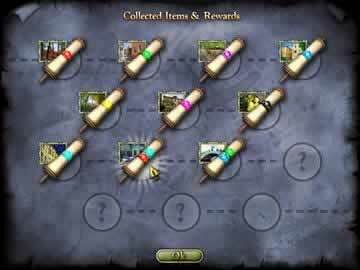 Doing so accurately gives you maps which help with saving the paintings and the sinking city. These mini-games are the only variation in the game. They are simple, yet provide for a much needed break of strictly playing mahjong. Having only a quest mode limits this game greatly, especially when compared to other mahjong games in the extensive genre. You will not be able to create your own layouts, play layouts others have created, choose what you want to play, or download layouts from the internet—all features other titles offer. The one game mode and lack of online capabilities make this game too simple and dull when compared to other mahjong titles. Also, having only one difficulty limits this game to a greater degree. Experienced players might find it way too easy, and this might be too much of a challenge for younger and less experienced mahjong gamers. Overall, Venice Mystery is just an alright game in a genre that is full of better and more complete titles. Having only one game mode makes this game lag in so many ways. Though it is surprisingly interesting, the storyline alone will not be able to keep you captivated. If mahjong is your game and you are looking to play every title, then by all means download. However, if you are just getting into the genre, you should keep looking because there are much better more complete titles. Video shows first few levels of gameplay.